What a fantastic meeting we had on this beautiful spring evening on Monday, 25th March. We had a full house with lots of members and quite a few guests joining us. Our club President, Dinah, opened and closed the evening, while I took on the challenge of being a Toastmaster (which meant I had to run the meeting). Angela stepped in last minute to be a Sergeant at Arms, taking care of the guests, and Matt made sure we stay on time. In the first part of the meeting, as usual, we had impromptu speeches (table topics). 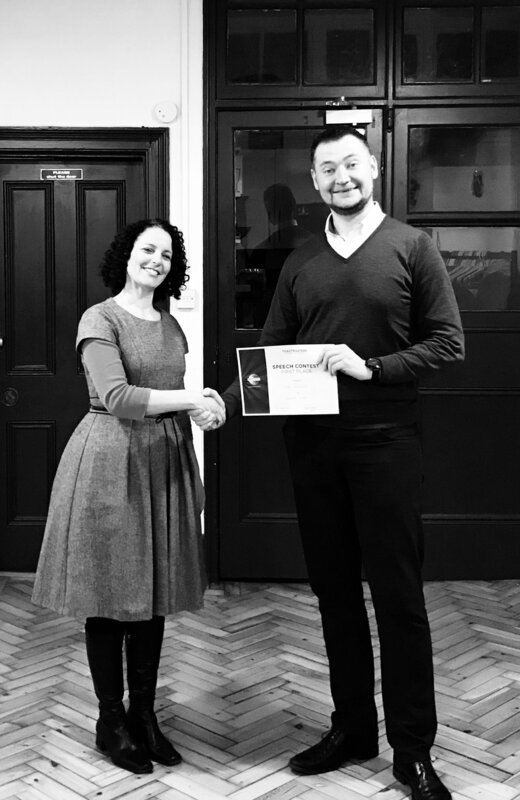 Paul, who has just achieved Advanced Communicator Gold status (congratulations, Paul! ), was the Table Topics Master & came up with a very apt theme of mobile phones. He “rang” the participants to ask questions such as, if you had a time machine, who would you call from the past? ; phone at the dinner table, eye or nay? ; would you rather lose your phone or your wallet?. We had many members and some guests giving it impromptu speaking a go and guess what? The winner of the best table topic title for the night was one of our lovely guests, Amanda, who answered the question of what would life be like without mobile phones. She told us a personal story about how back in the day her neighbour, who lived closer than her to the red phone box, would knock on her door when someone called her. Amanda beautifully took us back in time and was a deserving winner. In the second part of the meeting, we had four prepared speeches. Two of our new members, Jonathan & Thomas, gave their first speeches, both from the Pathways education programme. In his Icebreaker speech, Jonathan told us how he went from demolishing rooms to becoming a financial trader. While Thomas, took a slightly different approach and spoke about his love for marathons, his two turtles, Poka and Kiki, and told us about his job as a consultant for the oil industry. Our third speaker Alice, with a speech titled "Can I lend you some sarcasm?" was voted the best speaker of the night. As Alice explained her attempt to be less sceptical and sarcastic during Lent, she got us all laughing - her self-declared sarcasm, when combined with her sharp mind, always translates into amazing wit and this time was no exception. Last but not least, we had Vitalija, giving her 10th speech and achieving the Competent Communicator award from our previous educational programme. Vitalija spoke on the importance of values, skillfully used post-it notes to share her values with us and called upon everyone to identify what matters to us. What a great motivational speech it was! Well done, Vitalija! As with all Toastmasters’ meetings, we had all the impromptu and prepared speeches evaluated. Errol, who was visiting us from advanced Toastmasters club, Excalibur. He masterfully gave his feedback on Vitalija’s speech, including some excellent commendations and a few areas where he felt the speech could have been improved. A learning opportunity for all of us listening! He was voted the best evaluator. Thanks, Errol for joining us. 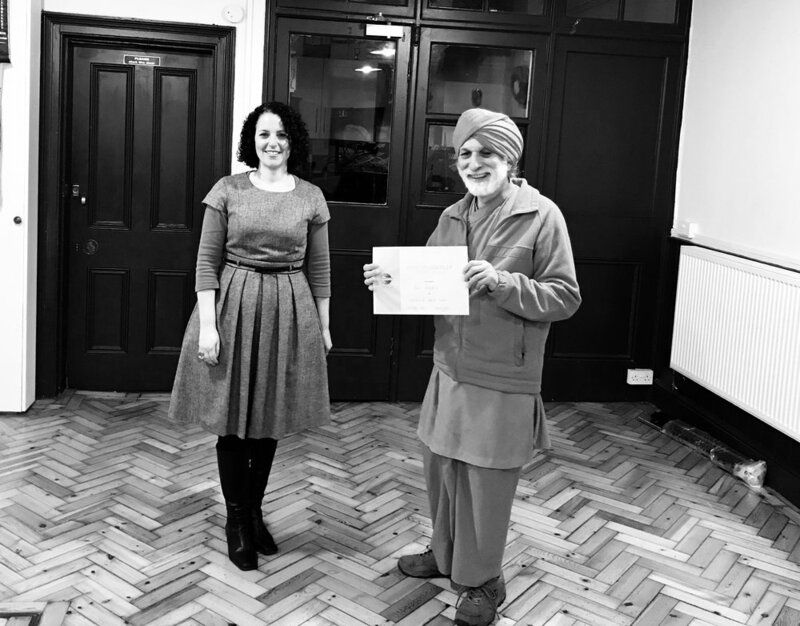 At the end of the meeting, Andrew, from London Business School Toastmasters club, evaluated the whole meeting - even though Andrew made some recommendations, we were practically basking in praise from him. Thanks for taking the time and your input, Andrew. More conversations and drinks followed down the pub. With many guests joining, it was a great night, and a suitable send off to one of our long-standing members, Jake, for his fourth round-the-world trip! A brilliant finale to this fantastic meeting. We are looking forward to seeing our members and any guests on the 8th of April at 6:45 pm. Please note, we will be at a different location, The Island Queen Pub, 87 Noel Rd, London, N1 8HD. Written by Laura Paplauskaite, Club Treasurer and Digital Officer.